This post introduces my first guest blog and blogger which will be appearing this Friday. Morningjoy’s Weblog was one of the first blogs I commented on when I started this blog a little over two years ago and has been in my list of Favorite Blogs ever since. Karen Gallagher, who I like to call MJ for Morningjoy, is a retired elementary school teacher from the Midwest who has an informative way of writing and a passion for photographing the wildlife found in the wetlands of southern Florida. I have watched her skill as a photographer grow over the last two years and am happy to have her as my first guest blogger. Great Egret flying with a twig over a Florida wetland. MJ writes a couple of different kinds of articles on her blog. In her quest to photograph her subjects, she researches to understand when and where they are best found. In so doing, she shares this knowledge with illustrative photographs in natural history photo essays bringing us the drama, humor and behaviors of her subjects. Karen will then go beyond the facts and show us the wonder and gift of God’s creatures in original prose using her talents as a poet and photographer. 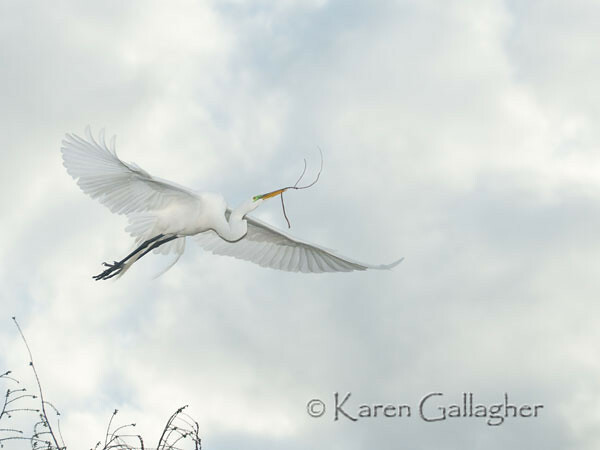 For her guest blog, Karen will be talking about how to capture birds in the wild and in flight. These are not just any kind of birds…they are white birds. If you are interested in doing a guest blog, leave me a comment. This entry was posted in Animals, Nature, Photography and tagged birds, florida, great egret, guest blog, karen gallagher, morningjoy, white. Bookmark the permalink. That egret looks like it was posing just for Karen. What a beautiful shot. Karen seems to have a way with getting the birds to pose for her. She talks about it in the guest blog tomorrow. Stay tuned! I found Karen’s blog through yours, and love to visit. There’s always something beautiful, intriguing, or both. Great way to get the fence painted, Scott! Thanks, Gerry! Karen white-washed the fence as you’ll see tomorrow. Wow, that picture is so perfect it almost doesn’t seem real; wonderful shot! Wait until tomorrow. This photo is just the appetizer. Oh, her blog is wonderful! I used to follow it, and then I changed so much on my own blog that I lost the address. Now I can read it again. Thanks! Yeah, Camilla! Karen will be so happy you found her blog again. This image of Great Egret is fabulous as well as the images of the Snowy Egret at her blog. Egrets are hard to photograph and she is spectacular in photographing them. Thank you for sharing about Morningjoy. I’ll will regularly check her blog. Awesome, I so want to get into photographing birds, I love seeing this work. What a wonderful idea to showcase different work you love.